Humankind is a social species, and only by putting People before unbridled profits can the New Age begin. Workers make everything that is used and enjoyed. The workers have nothing to lose but their chains. We have a world to win and, in that sense only, we are "Reds." We have Being - SAT. But we must stretch forth and Become - TAN and, in that sense only, we are SaTanists. 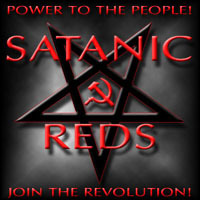 Satanic Reds, SR., Social Realists. Are you one? See below and see our FAQ. Are you an SR Satanic Red? SR also means Social Realist! CLICK HERE AND SEE. IF SO - JOIN! DO WE HAVE RITUALS? YES!